That's the word of the day over at Conblogeration. I remember the first time I became aware of this word was when I was in high school. 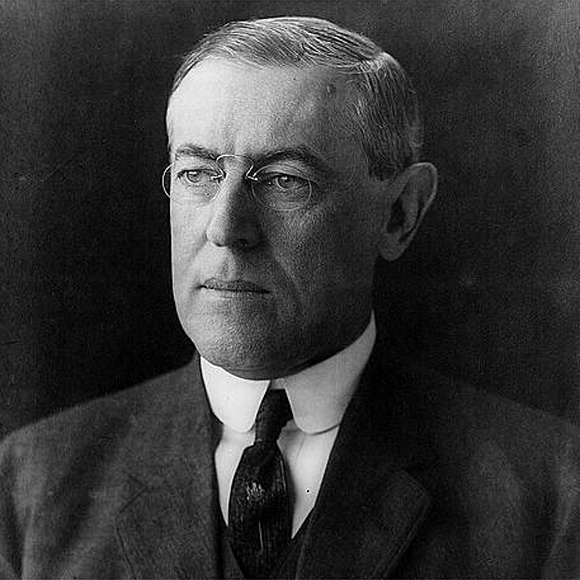 I was reading Arthur S. Link's biography of Woodrow Wilson and Link quoted Wilson calling a position taken by an opponent as anathema to him. It's the perfect Wilsonian word, when you think about it. Wilson always saw things in moral absolutes, even when the position he anathematized was one he himself adhered to just a few years before. It isn't that Wilson was a flip-flopper. Rather, he converted, as when he moved from being a conservative Democrat to one of the progressive stripe. Once Wilson "converted," he couldn't understand why or how anyone could disagree with him and he viewed those who opposed him as reprehensible. This accounts for why, as president of Princeton University, governor of New Jersey, and President of the United States, his initial successes were always followed by spectacular failures. People who anathematize others almost always eventually become anathema themselves. What is It About Thugs? Robert Mugabe, the president of Zimbabwe, is a thug. He has been for a long time. His allies, with his overt public approval, have recently undertaken a campaign of beatings and intimidations of those who oppose his dictatorship. It's an old story, this use of force to quell dissent and maintain tyranny. Eventually, history shows, all tyrannies fall and tyrants almost always come to bad ends. If the original tyrants don't, their heirs do. All of which raises some questions: Don't guys like Mugabe, Hitler, Mussolini, Saddam Hussein, and others read history? Don't they realize that eventually, the unjust use of force, intimidation, and thuggery eventually ticks people off and leaves tyrants in bunkers with cyanide tablets or on the ends of ropes? What is it about thugs that thinks that they can keep on getting away with murder? I suppose that all tyrants, like all other sinners who refuse to subordinate themselves to God, figure that they're history's exceptions. They'll be the ones, they think, to get away with treating the rest of the human race like superfluous extras in the epic story of their own lives. Pray for the oppressed people of Zimbabwe tonight, asking God to protect the innocent and to embolden the people to end their tyranny. Some people tell me, "If only I could see a miracle, I could believe." Or, despondent over the fact that someone they care about refuses to believe in the risen Christ we proclaim this Easter Sunday, others say, "If only so and so could witness a miracle, they could believe." Let me tell you a true story. When I was in junior high school, my mother was diagnosed with cancer. She was admitted to the hospital one day in order to undergo surgery the next day. But on the morning of the scheduled procedure, the doctor came by her room. He was mystified. A final round of tests conducted the afternoon before showed no cancer. He didn't understand how this could have happened. But we all did: People had prayed and in the mysterious providence of God, my mother was healed. I knew all about what had happened and yet within a few short years, I came to consider myself an atheist. I continued to say that there was no God for about eight more years after that. That's the thing about miracles: They're as subject to questioning and rejection as the statements, "There is a God" or "Jesus is risen from the dead." To believe in a God Who is bigger than us or in a God Who becomes human, offers Himself as the perfect sacrifice for our sin, and then rises from death to give everlasting life with God to all who believe in Him is not an easy thing. We human beings are such control freaks that even when we see the miraculous or inexplicable, we want to explain it away. We always want God to prove Himself with just one more piece of evidence. Jesus once told the story of a man who had died and was burning in hell. In his life on earth, he had been an unjust man who ignored the needs of a poor man, Lazarus, who died at his gate and had gone to heaven. From hell, he called out to Abraham, the patriarch of Old Testament faith, begging him to send Lazarus back to earth to warn his brothers of the fate that awaited them if they didn't trust in God. Surely, the rich man reasoned, if they saw someone back from the dead, they would listen to God's Word and believe. Forget it, Abraham responds in Jesus' story, if they didn't pay attention to the ways in which God revealed Himself through Moses and all the prophets, there's no way they'll pay attention to someone resurrected from the dead. Belief in God isn't antithetical to the life of the mind. We don't check our brains in at the church door. But faith isn't the byproduct of the smoking guns of miraculous evidence, either. "Have you believed because you have seen Me?" Jesus asked His once-skeptical disciple, Thomas. "Blessed are those who have not seen and yet have come to believe." God Himself makes it possible for us to believe...but only if we are willing to believe. This is where the credibility of Christians becomes so important. Mahatma Gandhi was one of the greatest people in human history. He was once asked why he, who had closely studied the New Testament and whose tactics for bringing freedom to India came directly from Jesus, never became a Christian. He had, it turns out, been quite open to following Christ. But as a young lawyer in South Africa, he was subjected to ill-treatment by Christians. He concluded that if the people who bore Christ's Name were so un-Christian, it was pointless to follow Christ. Christians, of course, are sinners just like the rest of the human race. We are imperfect. We do things that we have every reason to regret. But when others see the direction of our lives...when they can see that when we sin, we regret it and seek to move toward the love of God and neighbor to which Christ calls us...when they see in us a commitment to service..when they see the risen Jesus Christ evidenced in our living, these things are seen as greater indicators of the reality of God and the truth of the resurrection than any number of miracles. God will never force us to believe in Him or follow Him. But if we are willing to believe, the Spirit of God will begin to fashion faith within us, making it possible for us to join those ancient confessions of the Church: I believe in God the Father! I believe in the risen Jesus Christ! I believe in God the Holy Spirit! I urge Christians to pray for their skeptical friends and neighbors to move toward a willingness to faith and to ask God to help all of us become believable, loving, serving witnesses for our Savior. And if you are among the skeptical or the scoffers like I once was, I hope that you can move toward the moment when you can tell God, "I'm not even sure you're there. But I want You to be and if You are, help me to know You and to follow You." Don't be surprised if from that tiny opening, the Holy Spirit lovingly nudges you toward faith in the risen Christ. That's exactly what happened to me...and that really is a miracle, when you think about it! Christ is Calling Us Forward! I was driving home from a grocery run last night and flipped on a CD, John Reuben's latest, which I love. But I've played it so much since buying it that I decided to look for something on the radio. I tuned in to one of our three local NPR stations, WVXU, which runs the series When Radio Was, featuring old radio series. Last night, the show ran an episode from The Great Gildersleeve. It was an Easter episode, aired on April 17, 1957. In it, Throckmorton P. Gildersleeve, the Water Commissioner who was the series' main character, movingly tells the story of Christ's crucifixion and resurrection. It's almost impossible to imagine an episode like it happening on a network TV sitcom today. But that isn't what stunned me most. A commercial break came and then, on behalf of the NBC network, the announcer told listeners what good things came to the lives of individuals and families who became involved in the life of a local church. He then mentioned a long list of radio shows that NBC would be running the following Sunday, Easter. It included The Catholic Hour, The Hour of Decision with Billy Graham, and The Lutheran Hour. But, he went on, none of that could possibly replace the blessings that would come to those who celebrated Easter in a local church. And, he added, listeners should, "Take the whole family with you." Now, if you think I'm about to bellyache or rant about a secular mainstream media that no longer gives Christianity a preferred position, you'd be wrong. I'd be happy if major media outlets told the world about Christ and our need of Him. But those days are over. Besides, I believe that something terrible happened to churches and Christians when the mainstream media promoted Christian faith: It got Christians off the hook when it came to sharing Christ or inviting folks to worship. Christian faith was "in the air." The culture could be counted on to carry the freight when it came to fulfilling Christ's command to make disciples. With that sort of "home court advantage," Christians became lazy about fulfilling Christ's Great Commission. When, seventeen years ago, I was called to start the congregation I now serve as pastor, my then-bishop approached me during an informal get-together. He had been the founding pastor of a congregation in the Akron area back in the 1950s. "You know, Mark," he told me, "I had it a lot easier than you will have it. Back then, I just had to show up and announce that I was starting a new church. In no time, we had 500 members." Seventeen years later, our congregation has about one-third that number of members. Personally appealing preachers and megachurches are able to attract vast throngs these days, it seems, and I don't begrudge them that. But their experience doesn't match that of most pastors and churches in what has been called a post-Christian era. Their experience certainly doesn't match my own. Christian faith no longer enjoys privileged status in Western culture, meaning that Christians intent on seeing the life-changing good news become part of their friends' and neighbors' lives must take on the responsibility of sharing Christ themselves. In spite of the ascendance of the Religious Right, which I feel mostly distorts Christian faith and makes Christ onerous to a culture ignorant of what the Bible really shows us about Him, the position we Christians find ourselves in today is not entirely different from the position the early Christians were in fifty days after Jesus rose from the dead, the day of Pentecost. Then, as now, Christians lived in a pluralistic world willing to latch onto all manner of gods, idols, good luck charms, and karma. It was a world, like today, where Christians had to, through their love and service in Christ's Name, earn the right to share Christ with others. Then, as now, Christians have God's Holy Spirit to guide them as they live and share the love, the wisdom, and the hope we have through our faith in Christ. It would be easy for Christians to listen to the episode of The Great Gildersleeve I heard last night and fall prey to a sort of mournful nostalgia, pining for the "good old days." But Christian faith isn't about nostalgia. Christian faith doesn't pull us to the past, but to the future. On the first Easter, according to the Gospel of Mark, one of the angels told the women who had gone to anoint Jesus' body, "But go, tell his disciples and Peter that he is going ahead of you to Galilee; there you will see him, just as he told you.” (Mark 16:7) Jesus, described by the New Testament book of Hebrews, as "the pioneer and perfecter of our faith," is always ahead of us, always calling us forward, always making us new. Jesus Christ calls us away from the comforts of the past, to dare to live today in complete dependence on Him, certain that we belong to Him forever. That means we can be confident as we ask others to turn from sin and follow Christ. The voice of Gildersleeve is only on recordings now. NBC isn't going to recommend that people worship with us on Easter Sunday. But Christ is still risen from the dead! The Holy Spirit still lives within Christ's people! The world still needs to know Christ! And followers of Jesus still can use their lives, their service, and their voices to tell everybody about our Savior! But first, a story to explain why we need these gifts. On Tuesday, I was in a hurry, yet stuck in checkout line 4 at Kroger Eastgate. I wondered if there really was a worldwide conspiracy designed to keep me from doing what I wanted to get done. Just then a clerk popped his head out from between two unused check out lines. “You can check out on three now,” he announced. A woman who’d just happened by when the clerk appeared, quickly slid into line 3 and I pushed my cart in behind her. I was internally celebrating my good fortune when I looked back and saw the woman who had been standing in front of me in the congested line. It wasn’t until I left the store that I wondered--or maybe it was only then that I allowed myself to wonder--had I stormed ahead of her? I felt a pang of guilt. After all, she’d gotten into the longer line before I had. Hers was the right of first refusal on entry into the newer, quicker checkout line. Bags stowed in my van, cart put into its corral, engine on, I briefly considered trying to find the woman to say, “I’m so sorry that I pushed ahead of you like that. I didn’t intend to.” But I realized that would have been a lie. Whether I actually had pushed ahead of her or not, the fact is that I'd intended to push ahead of whoever was in my way. I had been in a hurry and I thought the world owed me. That’s your pastor, folks. Not a pretty sight, I'll admit. I had been guilty of me-first thinking. But the Bible has a more direct term for it: sin. You and I are born with the condition of sin, a condition of alienation from God that predisposes us in big ways and small to push ourselves ahead of others, at the expense of others. To worship ourselves. To leave God and neighbor in the dust. It’s sin that makes our world such a mess. It's sin that messes up our individual lives. So what’s to be done about it all? God has done something about it and that’s why we’re here tonight! And that leads me to discuss those four gifts. As I mentioned a few Sundays ago, washing the feet of another person was generally only done either by servants or by a loved one anointing the body of a deceased family member. (And sometimes, as a liturgical action in Jewish worship.) It wasn’t done by a lord. Or a king. Or an important person. But God-in-the-flesh, Jesus doesn’t care about usual human conventions. He breaks our rules in order to break us free from the grip that sin and death have over us. He breaks our rules in order to break the kingdom of heaven open to us. Jesus deals with sin first of all, by giving us example. In Him, we see what a life free from the sinful impulse to push ahead of others was banished. That's the first of the four gifts I want to discuss tonight. But, thank God, following Jesus Christ is about more than having an example. The condition of sin prevents us from living and acting like Jesus. No matter how much I may want to be like Jesus, I can’t use my will power to follow His example. At least not for long. That’s where the next gift comes in. It was given, of course, less than twenty-four hours after Jesus washed the disciples’ feet. He went to the cross, becoming what John the Baptizer had said of Jesus on the banks of the Jordan, “the Lamb of God Who takes away the sin of the world.” There, Jesus entered into our alienation from God and accepted our sentence for sin, so that rising from the dead, He could offer new and everlasting life to all who believe in Him. Jesus saves sinners like me. Jesus isn’t just an example. He’s also a Savior. Thank God! But the events of this night remind us that there’s more to being a Christian than having an example or being saved. This day is called Maundy Thursday, the word maundy coming to us from the Latin word mandatum, meaning mandate or command. That’s because after washing the disciples’ feet, Jesus gave a new command to all who make up His Church. You and I are called not simply to love God and love neighbor. We’re also called to love each member of the Church, to respect one another, to build each other up, to help one another experience the grace and goodness of God, given as free gifts to all who believe in Christ. You can't be a Christian without being part of the Church, this family instituted by Christ. The Church is the living embodiment of Jesus in our world. The Church is the place where recovering sinners are made to feel safe and where in our fellowship with one another, we experience Jesus using us to love others. That’s our command! Fortunately for us, our Savior Jesus doesn’t just give us an example, save us, or give us a command without also giving us the means to fulfill His call on our lives. That’s where a fourth gift of Maundy Thursday comes in. That gift is power. Jesus gives us the power to live as saved people, the power to follow His example even when we’ve failed, the power to recommit ourselves to doing as He commands despite our sinful natures. A few days ago, I met with Tiffany and her mother, Paula. Tiffany will receive Holy Communion for the first time on Easter morning. One of the things we talked about was the old saying, “You are what you eat.” Eat lots of fatty or sugar-filled foods and you end up looking like I do around the middle. You are what you eat. In a mysterious way we can’t understand or explain, Jesus literally enters into the bodies and the lives of those who renounce sin and entrust their lives to Him. We each come together in humble need of Christ and His forgiveness and He gives to each of us His very self. Christ uses this sacrament to help us, from the inside out, to follow His example and to fulfill His commandments. In the body and blood of Communion, He sets to work to transform the lives of those willing to follow Him. Through the Sacrament, Christ makes us more like Himself. Jesus gives us power to become Christlike. We are what we eat. the power to become more like our Savior by regularly receiving His body and blood in the Sacrament we’re about to receive again. Speaking as one needy sinner to other needy sinners, I have to tell you how grateful I am that tonight, I have a Lord who loves me enough to give me these four gifts...and so much more! That's the title of this post. The writer? A political conservative and an evangelical Christian, Will Hinton. Whether you agree with him or not, like everything Hinton writes, it's interesting. What's that? Here's a link to some past Maundy Thursday blogging that might help explain. Also see here for an understanding of where the day fits in with the overall church calendar. To be recognized for being thoughtful by someone who is always thoughtful is a huge honor. Thank you, Charlie! Former Tennessee Senator Bill Frist has been on the Fred Thompson bandwagon for several weeks now. See his post here and take a look at the massive number of comments in response to it. The Dynasties Continue...Chelsea in 2016? The ascendancy of dynasties as a feature of US presidential politics has been confirmed with reports on the first quarter fundraising efforts of major candidates for President. That's an even bigger story, to my mind, than the sheer enormity of several campaigns' treasure chests. The Clinton machine, intent on electing a second Clinton in sixteen years, raised $26-million in the quarter just past. Meanwhile, the Bush machine, bowing to the fact that Jeb Bush can't succeed his brother to the Oval Office in the face of an unpopular war, is siding with another old Republican monied dynasty, the Romneys and their allies. Bush allies have fattened the presidential coffers of former Massachusetts governor Mitt Romney in his bid for the 2008 Republican presidential nomination. The Romney campaign raised $21-million in the same first quarter. Clinton and Romney acquired that kind of money in spite of the fact that neither have much elective political experience--she's just begun her second term in the US Senate and he spent all of one term as governor. Fund raising efforts for the 2008 campaign thus far confirm fears that the presidential contest may provide voters little opportunity to elect someone with new ideas. Instead, the election is likely to pit two dynastic families or their functionaries, people accustomed to wielding power, in a sort of War of the Roses. Clinton and Romney are different packaging for old brand names. Increasingly, US politics at every level sees certain families with money and connections dominating government. It's a phenomenon that exists in both parties. Last year, for example, there were about ten races for the US House that pitted the children of former members of Congress against one another. So, irrespective of how things turn out in 2008, you might want to start getting ready for 2016, when Chelsea Clinton, who turns 36 that year, will likely run against Jeb Bush, by then the beneficiary of Bush nostalgia, in another contest involving America's presidential royalty. THANK YOU, BUCKEYES, FOR A TREMENDOUS SEASON! We've waited forty-seven years for a national championship. But with the thrills and greatness you've shown us this year, I believe that we'll only have to wait one more year. Congratulations to the Florida Gators and their fans. One reason people give for not going to church is their mystification at two words--and their different forms--which Christians use a lot: sin and justification. All have sinned and fall short of God’s glory. I’m not sure that we Christians always know what we’re talking about when we say stuff like this. So, mystification on the parts of those who aren’t part of a church is understandable. What is sin, from a Biblical perspective? And what does it mean to be justified? In this column, I’ll talk about sin. In the next, I’ll tackle justification. I like to draw a distinction between Sin, capital s, and sin, lower case s. Sin, upper case, is the condition into which every person who comes into this world in the normal way is born. In the Old Testament, King David, a person so revered for his faith that the Bible calls him “a man after God’s own heart,” admits that he was born in sin. The only sinless person on this planet since Adam and Eve fell into sin has been Jesus Christ. The rest of us though, are born in this Sin condition. Sin is alienation from God and other people. And it’s part of us from the beginning. We’re born addicted to ourselves, our desires, our wants, and our agendas. If an infant takes a liking to an object which his or her parents know could cause injury or death, that baby will scream like mad when the object is taken from it. That’s because the condition of Sin drives us to think only of that which is pleasing to ourselves, without regard to what’s good for us or others. craving the possessions or lifestyles of other people. I don’t know about you, but when I look at this list, I recognize that whether in thought, word, or deed, I’ve violated each of God's commandments. I’ve allowed my Sin condition to lead me to commit sins. Deep down, I don’t want to sin. I recognize how my sins hurt me, my life, others, and, I’ve learned, even God. Each time I sin, I add another brick to the wall separating me from others, from the person I want to be, and from God and eternal life. This is true even when, with good intentions, I make resolutions to do better and fail to do so, repeatedly. Who, Paul asks and I ask, can make it possible for a born sinner like me to be freed from my slavery to sin so that I can live with God forever? That really is the question. And justification, which I’ll talk about next time, is the real answer. God’s answer. Labels: justification, sin, why should I go to church? I saw them, three young men struggling to make it across the parking lot of the Kroger I visited two nights ago. You could tell that each step they took was difficult as they waddled, rather than walked. Finally, they made it to their car. But I couldn't help wondering, "What's wrong with them?" The source of their struggle? The three were part of that growing army of young men who apparently don't know how to wear pants. Someone needs to tell them that a waist band is just that, a waist band, not a halfway-down-your-backside-band. One of these kids, fresh from his shift at the grocery store continuously tugged at his pants to prevent them from completely sliding down to his ankles over the course of the fifty-yard trek. Repeatedly, he reached down to pull up his pants just enough to keep from falling headfirst onto the pavement. A time-motion engineer would probably deliver a staggering calculation as to how much productivity this young man is losing each day as he's forced, stride by stride, to use one hand or the other to pull his pants up just slightly north of the knees. It's ironic to me that a generation so intent on using its hands for things like text messaging and video game-playing can't see how the way it wears its pants keeps it from doing those and other things. I wonder what these kids think the crotch of their pants is supposed to be, if it seems natural for the inseams to gather just above their shins? The design of a pair of pants signals that this sagging fashion is all wrong. And do they think that the world is dying to see their boxers or briefs? Speaking humbly on behalf of the world I can confidently say, "We're not!" Nor do we want to see the even worse sight to which we're often subjected by these young men unfamiliar with the proper use of waistbands, drawstrings, or belts. I refer specifically to the unsightly "cleavage" their fashion often forces us to witness! Not long ago, I watched a toddler taking some of his first steps. At one point, he felt his pants slip ever so slightly down over the top of his bulging diaper. When that happened, he realized that continued slippage would prevent him from taking further steps. Who knows, he might have even been a little embarrassed at the prospect of having the whole world see his little baby undergarment? In the face of these facts, he did what any sensible person would do: He pulled up his pants. One can only hope that the young men who sport their penguin-pants would learn from that toddler! Please, young men: Pull up your pants. Tighten your belts. Tie your draw strings. Keep the undergarments under. Learn to walk again! You'll like it, I guarantee. Of course, a little boy of a different nature might not have been so sure that there was a pony to be found. He may have decided that where there’s manure, there’s always...more manure. The point is that two people may react to the same events, experiences, or people in completely different ways. Most people seem to love American Idol, for example. And while I get a charge out of hearing what my friends tell me about the latest episodes, I’ve never even seen it because it just doesn’t appeal to me. We all have different tastes and 99.9% of the time, our diverging views don’t really matter. But sometimes, our varied reactions to life have deep significance. Back in early 1974, I had just started to date a girl I’d been wanting to take out for a long time. But she was going to be away one weekend. Another girl and I decided to go see a movie, just as friends, we thought. In January, 1974, I showed up at the other girl's apartment, taking my life in my hands in order to walk across her icy parking lot in my black high heel shoes, plaid bell bottoms, and blue velour shirt. The rest is history, as they say. But if I hadn’t reacted to Ann and the opportunity presented by the vacant weekend in the way that I did, I might have missed out on spending the last thirty-two-plus years with my wife! There’s a reason I bring all of this up. And I'll explain it in just a moment. Whenever we think of Palm Sunday, I suspect that we conjure up thoughts of palm leaves waving, “Hosannas” being shouted, and vast throngs of people welcoming Jesus into Jerusalem on the Passover week that would bring His crucifixion. But if you look at our lesson from the Gospel of Luke today, you find none of those things. And, as to crowds, our lesson only speaks of “the whole multitude of disciples,” meaning the hundreds of people who were followers of Jesus. But Luke doesn’t mention the thousands who would have been in Jerusalem preparing to celebrate the Jewish Passover when Jesus arrives in the city. What are we to make of these differences in the ways the four gospel writers tell the story of that first Palm Sunday? It all boils down, I think, to focus. Each of the gospels have different themes on which they focus, different aspects of Jesus’ story and of Christian faith. And even more particular to today’s lesson, Luke’s account of the first Palm Sunday comes as part of a string of incidents in Jesus’ ministry and parables he tells that hammer away at a single theme. We see this theme earlier Luke, chapter 19, where we read of Jesus' encounter with a man named Zacchaeus. You know the story of Zacchaeus, probably. "Zaccheaus was a wee little man, and a wee little man was he," many of us were taught to sing as we were growing up. Jesus was traveling through Zacchaeus' hometown. Being a person of short stature, Zacchaeus climbed into a sycamore tree in order to get a good look of this celebrated preacher from Nazareth. When Jesus saw Zacchaeus, He called him down from his perch, explaining that He intended to visit Zacchaeus' place right then and there. Zacchaeus climbed down out of his tree and welcomed Jesus. The problem, as some of the good people of that town saw it, was that Zacchaeus was a notorious extortionist. But it wasn't to those supposedly good people that Jesus said, "Today salvation has come to this house." It was to Zacchaeus. The difference between Zacchaeus and the good church people was that he welcomed Jesus, while they rejected Him. 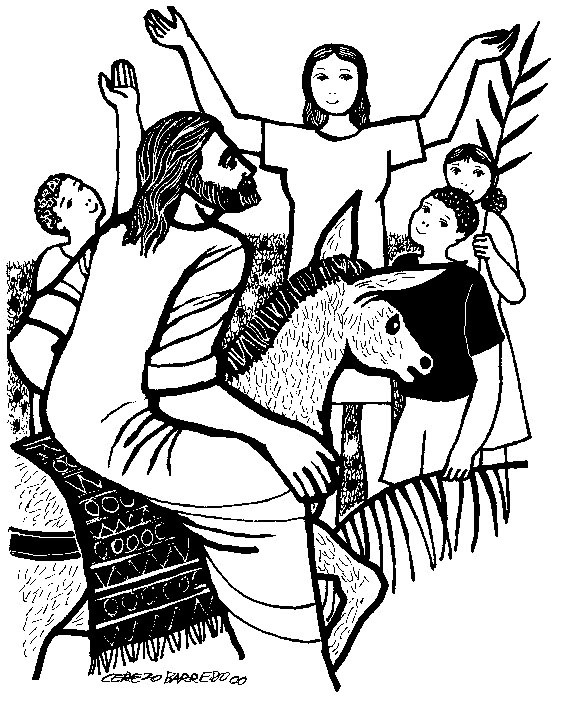 Later in the chapter, just before Palm Sunday, Jesus tells a story that talks about a king who left his people for awhile, just as Jesus would do after dying, rising, and ascending back to heaven. Some of the king's subjects excitedly welcomed his return. Others didn't want him around. As we come to his account of Jesus' entry into Jerusalem, Luke isn’t saying that there weren’t palm leaves, hosannas, or adoring crowds that first Palm Sunday. But, like a filmmaker showing us one or two people in a scene involving thousands of others, Luke wants to show us something very important, seen in the reactions to Jesus of two relatively small groups of people. The first is Jesus’ disciples. You and I know that at this point, just days before Jesus was to die on a cross, the five-hundred or so people who followed Him still didn’t get Him. They thought that Jesus would be sort of king who would get rid of the Romans, lower the taxes, and be good to God’s people. But to the extent that they were able at the time, before the crucifixion and before Jesus’ resurrection, they hailed Jesus as their king. They laid down their cloaks as an act of deference and respect. They praised God for Jesus and spoke enthusiastically about all the godly miracles Jesus had performed. They welcomed Jesus into their capital city of Jerusalem and into their lives. Then, there were some Pharisees. The Pharisees, you know, believed that they could earn salvation and forgiveness of sin, not accepting the teaching of the whole Bible that these things are gifts granted to those who turn from sin and trust in God. Appalled by the display of devotion put on by the disciples, they tell Jesus, “Teacher, order your disciples to stop!” They rejected Jesus as the king of either Jerusalem or their lives. Those who reject Jesus reject peace in their hearts, life with God, and eternity. Those who welcome Him receive peace, life, and eternity. Jesus can either be the rock on Whom we build our lives or the stone on which we crash and eternally self-destruct. What will we choose to allow Him to be in our lives? A couple from our congregation told me about something that happened when their granddaughter, then young, now a teen, burst from her bed room, where she had been reading the Bible. "I get to live forever!" she said. So do all who welcome Jesus into the center of their lives. And even if the rough and rugged times of life, we have the promise of a God Who loves, forgives, and gives us life forever! As the disciples welcomed Jesus into Jerusalem on the first Palm Sunday, they had no idea what they were getting into. They didn’t realize that their king would have to die and rise before He could claim His crown. They had no idea that following Him meant turning their backs on their sins, even the ones they loved to commit, so that they could take hold of the forgiveness and new life only Jesus brings. For some, following Jesus would mean death at the hands of their persecutors. For most, it would mean being rejected by family, friends, and society for trusting in the Savior they saw dead and risen. But each day for the rest of their lives, they chose to welcome Jesus. For them, accepting the brief and earthly complications associated with following Christ was a small price to pay compared to spending eternity at His side. As we prepare to celebrate Maundy Thursday, Good Friday and Easter this week, may we commit ourselves to always welcoming Jesus!